Shoe Cream: Colourless cream to care for smooth leather. Polishing Glove: Microfibre glove to care for smooth leather. Perfect for easy application of our cleaning and care products. Machine washable at max 60º C.
Protect & Care: Provides long-lasting protection against dirt and moisture while nourishing the leather with its olive oil base. Suitable for smooth leather, suede, nubuck and fabrics. Solvent-free. Propellant-free. 90% natural active ingredients. Clean & Care: Removes dirt and hydrates leather and fabrics thanks to its natural bamboo extract. Suitable for smooth leather, suede, nubuck and fabrics. Solvent-free. Propellant-free. 90% natural active ingredients. 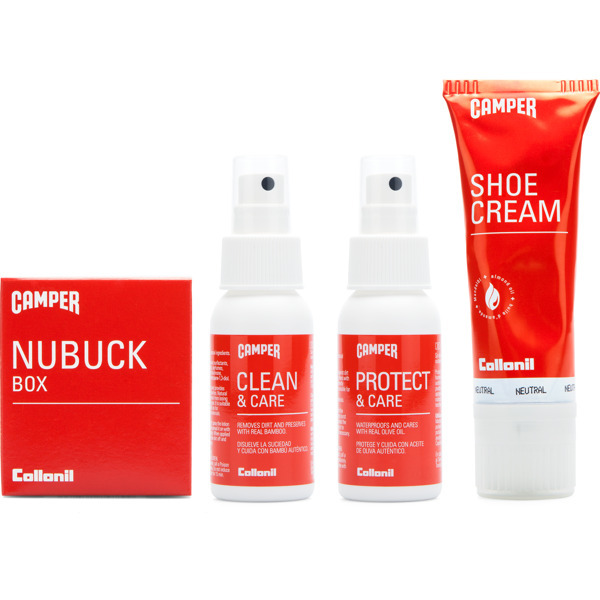 Nubuck Box: Foam rubber sponge for removing dirt from suede and nubuck. 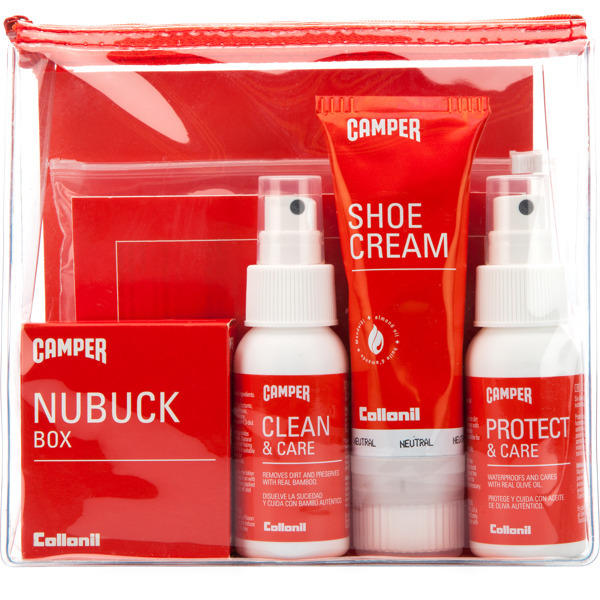 The Camper shoe cleaning kit is designed to travel with you, so your shoes will always be in mint condition wherever you go.